The mineiro singer/composer Sérgio Santos has a rich history of collaboration with the poet/lyricist Paulo Cesar Pinheiro. Together they created over 180 songs, including all the tracks for Santos first two CDs, Aboio (1995) and Mulato (1998). In November 2000, Paulo Cesar Pinheiro published the poetry book Atabaques, Violas e Bambus. The three instruments of the title represent the three fonts of Brazilian culture: the atabaques stand for its African roots, the violas for its European sources, and the bamboos for its indigenous origins. The tri-racial crucible is one of Pinheiros best-known themes, having served as the topic of the celebrated samba Canto das Três Raças, a major hit for Clara Nunes. Yet in Atabaques, Violas e Bambus, the concept was taken to its logical extreme, as the poet utilized a vocabulary so specialized that a glossary was required to understand much of the content. Not long after the publication of the book, Pinheiro began to collaborate with two of his composer partners, Mario Gil and Sérgio Santos, on new songs for discs to be recorded by them. 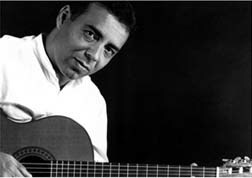 The work with Gil revolved around the indigenous component of the tri-racial formula, while the songs created with Santos were African in flavor. The latter were recently released on the disc ÁfricoQuando o Brasil Resolveu Cantar, which has already won a Best CD award at the Prêmio Rival BR in Rio de Janeiro. It would be natural to assume that the song lyrics were taken from Atabaques, Violas e Bambus, but as I questioned Santos about it, it turned out not to have been the case. DTDid the idea for Áfrico emerge from PCPs book or independently? 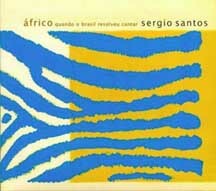 Sérgio SantosThe idea originally had nothing to do with PCPs book Atabaques, Violas e Bambus. It wasnt my intention then to create a work with these characteristics. I didnt think, Now I'm going to make a disc about our African influences. What I did in the beginning was an attempt to elaborate the rhythmic element in my compositions. Ive always been very preoccupied with the harmony and the melody. I had never been inclined toward the rhythm. This time I began by creating arpeggios on the guitar, and they led me to the creation of the compositions, still without lyrics. Suddenly I perceived that I had various tunes that sounded to me like having an African flavor. It seemed logical: if youre Brazilian and are going to research rhythms in depth, youll inevitably reach the originAfrica. However, Africa was my point of arrival, not that of departure. It reached me without my having looked for it, almost by chance. From that point, I decided to propose to Paulo Cesar that we should compose a totally thematic work, and he assimilated the idea in a magnificent way. He used an enormous variety of words from African dialects like Nago and Yoruba. And this is how the disc took shape. We ended up telling a story, which has always been what I like to do and is the way I always seek to record an album. DTDid you work with PCPs poems, or did he write new lyrics for the disc? SSAll the lyrics were written for this work. I think that PCPs lyrics provide the great thematic substance of Áfrico. They orient and direct all the content of the disc toward a Brazil that is there in the depths of us all. Its our history of miscegenation, people of mixed race seeking to build a cultural identity. And the lyrics tell of this long trajectory, from the beginning until today. I researched nothing to make the songs, theyre the result of my own life of a boy from the countrys interior, who heard the congados, the catopês, the folias de reis; and, as the son of a nordestino and a carioca, also the maracatus, the côcos, the cirandas, and the samba. It was as if I closed my eyes and allowed this life to do the talking. But exactly for this reason, the lyrics of Paulinho were so precious: If my tunes came to me in an almost unconscious way, his lyrics are my counterpoint. Because he did dig deep, researched, went to the roots on purpose. And the sum of these differences is for me the soul of the work. DTHow did you translate these concepts to the production of the disc? SSOne thing Id like to stress is the important role played by the musicians, the producer Rodolfo Stroeter, and the record company Biscoito Fino, who made all our ideas possible. For me, the great difficulty beyond the decision to record Áfrico was to know what type of sonority the disc should have. In Brazil this theme had been thoroughly explored, and it would have been a risk to repeat the idioms already utilized. I had to avoid everything that had been done along these lines, so as not to be repetitive. My commitment was to seek another avenue of sound. For this purpose, the musicians had to be hand-picked. I thought of constructing the percussions and the drums (Tutty Moreno, Marcos Suzano, and Robertinho Silva) as the support for the accumulated sonority. They would be my feet, firmly planted in the traditions of Brazil and Africa. Above that layer, I thought of musicians who were closely related to modern music and who had contacts with other musical languages (the pianist André Mehmari, the bassist Rodolfo Stroeter, the saxophonist Teco Cardoso, and the violinist Sílvio DAmico). I added to them the totally unusual and futuristic character of the mineiro group Uakti, which constructs its own instruments and possesses a uniquely characteristic sound. It was with these selections that I planned to guarantee the sonorous originality of the work. The participations of Lenine, Joyce, and Olívia Hime were also delicious. Once the team had been defined, we had to define how it was going to play. The songs dont have a defined rhythm; it wouldnt have been simple to record them. I couldnt enter the studio and say, lets play, this is a samba or this is a baião In some cases, the rhythmic progressions were mixtures of several rhythms. In others, one song could be played in several different rhythms. And several other songs had rhythms that didn't even exist, we had to invent them. So we did a pre-production. We went to São Paulo and shut ourselves in a studio for a week and played as if we were rehearsing for a show, until we found a definitive way to play. Then we went to the recording studio in Rio and, with the exception of my voice, the percussions, and the wind section, the group played together, like a live recording in a studio. There are many improvisations on piano with the saxophone that were possible only because we were all playing together. In short, the musicians contribution was immense. They were awesome, all of them. (Biscoito Fino (BF 508; 2002) 53:37 min. All songs by Sérgio Santos & Paulo Cesar Pinheiro unless otherwise indicated.